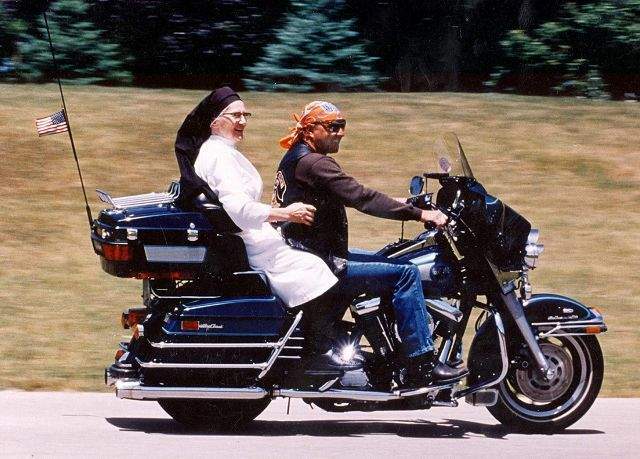 Sister Amallia of St. Monicas Senior Citizens Home rides with Don Kuzik on his Harley-Davidson motorcycle June 21 in Racine, Wis.
MILWAUKEE  Its the roar that made Milwaukee famous  the distinctive throaty rumble of a Harley-Davidson motorcycle. But that much-loved racket could be rumbling away to another state if the company cannot bring down its labor costs. Harleys corporate headquarters would remain here, but thats small consolation to a community that has endured repeated blows to its civic identity. But thats been changing. For example, beer giant Miller Brewing Co. moved its headquarters to Chicago in 2008 after merging with Molson Coors Brewing Co. Then there was Schlitz, which billed itself as the beer that made Milwaukee famous until financial and labor problems forced it to sell out to a Detroit company in the 1980s. That leaves Harley-Davidson Inc. as the citys lone signature brand. Its also a magnet for tourists, many of whom want to visit the factories where Harley engines are made. 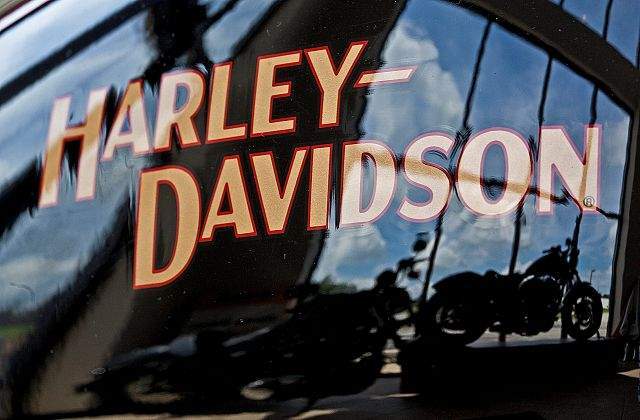 Harley chief executive Keith Wandell said the company will make its decision whether to move in the next two months. Harley executives already are scouting out other states, though Wandell will not say which ones. The company, he said, also would be open to incentives to keep the 1,630 manufacturing jobs in Wisconsin. But the idea that it could move production elsewhere stuns many Harley loyalists. Harley has been a local fixture for more than a century. It all started in 1903 when 23-year-old William S. Harley and 22-year-old Arthur Davidson began selling motorcycles built in a cramped wooden shed. The company later built motorcycles for the U.S. military in both world wars, which helped introduce the bikes to a global audience that saw them as an American icon. And a Milwaukee phenomenon. Prasad said when he travels to Europe, China or Japan most people respond blankly when he says hes from Milwaukee. Then he points out its Harleys hometown, and their faces light up with recognition. As storied a company as Harley has been, it has weathered some rough spots, too, most notably in 1984, when a banker had the option of allowing the company to refinance a $90 million loan or forcing them to declare bankruptcy. At the last minute, the banker allowed the company to refinance. According to the story, its because he owned a Harley. The famed motorcycles also have had a long history with Hollywood. Theyve appeared in films from Easy Rider to the more recent Simpsons movie. Elvis Presley rode one. And so did the Fonz in Happy Days  the classic TV sitcom that was set in Milwaukee. So if the Milwaukee-Harley marriage is so solid, how could the company even think of straying? Company spokesman Bob Klein said Harley wants to remain faithful, but its production schedule needs to be more closely aligned with seasonal demand, a change that would require approval from labor unions. Negotiations with the unions began in late July. The president of Harleys largest union did not return multiple messages seeking comment. Prasad, the UW-Milwaukee professor, doesnt see Harleys threat to move simply as a negotiating tactic. A company with a 107-year history is more concerned with the next 100 years than with making idle threats to extract short-term advantages, he said. Harley benefits the citys image and its bottom line. When the company turned 105 two years ago, about 100,000 fans from around the world joined the Milwaukee celebration. 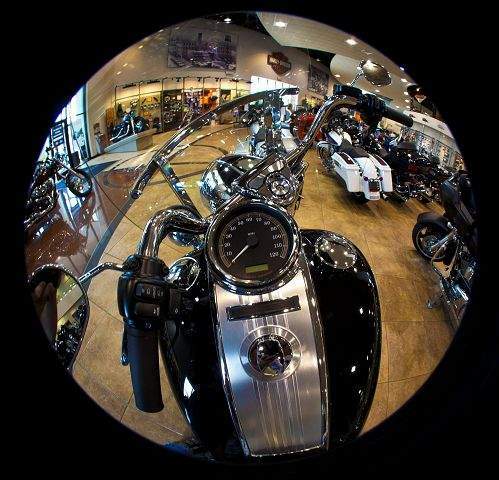 But even if Harleys production goes elsewhere, theres still a tourist draw here  the popular Harley-Davidson Museum. Whether thats enough to help Milwaukee cling to the brand that keeps it on the map is another question. Either way, the loss of Harley production would be another painful drop of water in the erosion of the citys proud working-class history, Milwaukee historian John Gurda said.